This review is way overdue. For months now the adorable box for the “Sun and Moon Tarot” by Vanessa Decort has been sitting on my desk, continually being reached over, moved to different stacks on my desk, and just generally being overlooked. I kept meaning to open it up, but other stuff managed to always force its way past the box to the front of the line. 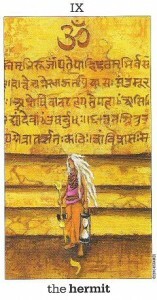 I’m sorry “Sun and Moon Tarot”; I should have opened you sooner because now I see what I have been missing. The “Sun and Moon Tarot” may be the most adorable tarot deck of all time. Vanessa Decort’s art for it is just so darn cute! She definitely colors outside the lines with her artistic interpretation of the tarot; playing with various cultures in her work. I wish I could sit here and wax poetically about it, but every time I look at a card I just find myself smiling and thinking, that is so damn adorable! 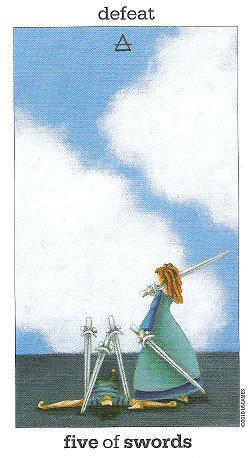 Has a Five of Swords ever looked cuter? How awesome is that Hermit? Beside the art, (Did I mention how much I love it?) the “Sun and Moon Tarot” integrates numerology and Sephirot, the tree of life in Judaic mysticism, so each card in the Major Arcana is linked to a symbol from the 22 character Hebrew alphabet. Count up the numbers of your birth date, including the date, month, and year. Following her example I take my birthday May 29, 1976 and break it down. If the number is higher than 21, you add the numbers together again, like this. 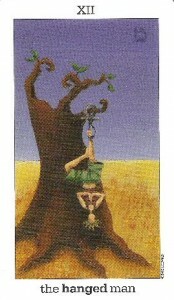 This number is The Hanged Man in the tarot. Oddly, I’ve always had affection for The Hanged Man. I’m not entirely sure why, perhaps it’s because he always looks at peace despite hanging there. Intrigued I flipped through the booklet to see what Decort says about The Hanged Man. And now my affection for The Hanged Man is even greater than before. I can’t tell you how much I adore the “Sun and Moon Tarot”. It’s simple, whimsical art gives way to rich symbolism and well thought out design. Buy it now. Previous postFreeze! It’s the Vice Squad! Part 6: Rap Music Strikes Again!